The longer I write about men’s clothing, the more disinclined I am to say what men should own. There’s tremendous variation in classic men’s style, and given that people live different lifestyles in different regions, it seems only the individual can say what’s right for him. Still, I’ve always found it interesting to read what others think comprises a basic wardrobe, and have found such articles incredible useful for my own wardrobe-building endeavors. So long as people use these as ways to think more deeply about what they should own, I think they have value. 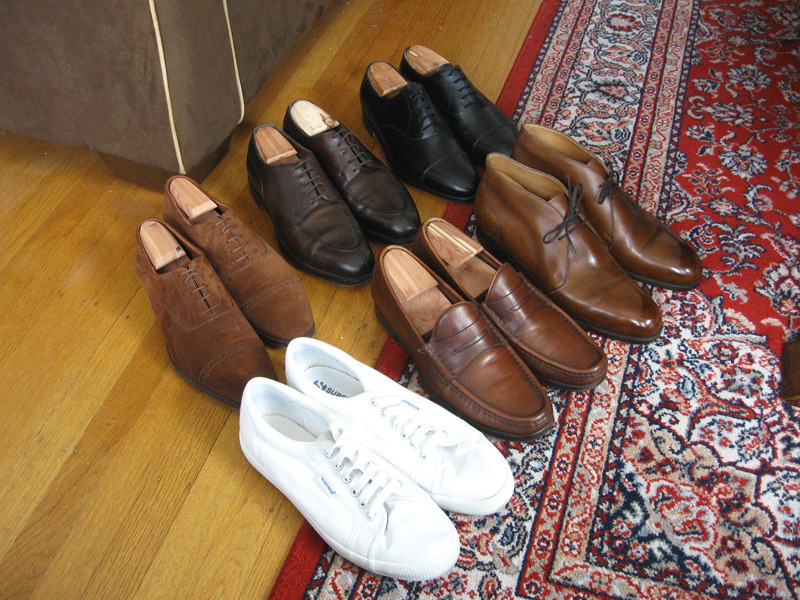 So, here’s what I think makes up a basic shoe wardrobe. Seven shoes, designed for weekday and weekend wear. First are your “formal” shoes, which can be roughly divided into those with open lacing and those with closed. Closed laced shoes, otherwise known as balmorals or oxfords, have eyelet tabs that are sewn underneath the front part of the shoe. They’re a bit more formal than open laced designs, which are also commonly known as derbys or bluchers. The black oxford: I think you should own at least one pair of black oxfords. You can buy these with punched decorations around the toe caps or go full brogue, but for the purposes of keeping to just seven shoes, I recommend a plain toe design or something with a smooth toe cap. These will be your most formal shoes and they can be worn with suits to weddings, funerals, and formal receptions. Even if you don’t go to such things often, you will at some point, and you’ll need appropriate footwear. Plus, as I’ve written before, I think men should have a pair of black shoes for the evening. Black calf just gleams better at night. Two less formal dress shoes: Of course, few of us are in a position where we need to wear suits often. Most men wear sport jackets and odd trousers, if not something even more casual. For these purposes, you’ll need two less formal dress shoes to rotate between during the workweek. There are a couple of options. The first are bluchers (open laced designs). Here the eyelet tabs are sewn on top of the front section of the shoe, making the foot less “dressed up.” For these, you can choose a plain toe design or something with a toe cap. Toe caps make the shoes slightly more informal, and something with decorative perforations around the edges of the cap is more informal still. For something truly informal, you can choose Norwegian split toes, like the pair pictured above, or wingtips, which have a rustic sensibility. Your other choice is to choose a brown oxford, which is more informal than black, and perhaps something in a casual material, such as suede. Like bluchers, these can have varying degrees of formality depending on the simplicity of the design. Toe caps and decorative perforations will always make a pair of shoes more informal, regardless if they’re of open or closed lacing. I suggest that these two pairs be brown. Assuming you buy something of quality, brown develops a more interesting depth and richness than black. Plus, it arguably looks much better during the day. So now we have one pair of black oxfords for formal events and nighttime wear, and two pairs of brown dress shoes (either bluchers or a more casual oxford) for the workweek. The penny loafer: Now for the weekend. For spring and summer, I suggest slip-ons. There are a dozen variations – driving mocs, horsebit loafers, boat shoes, etc. For something truly basic, I suggest brown penny loafers. The penny loafer is the sine non-qua shoe for post-war “Ivy Look,” but they don’t necessarily have to look Ivy or preppy. There are a dozen silhouettes these days to fit different styles, and a penny loafer can look as at home with a Continental look as it does with an American. Wear these with or without socks, depending on the weather and your style, but if you go without, be sure to know how to do it properly. The chukka boot: For fall and winter weekends, I recommend boots. Again, there are a dozen of variations. Balmoral boots are quite dressy, and something like a jodhpur is very casual and rustic. I think the most basic and easy-to-wear boot, however, is the chukka, sometimes also referred to as the ankle boot. In some areas of the world, it’s acceptable to wear certain chukka boots with suits, but I think they’re most safely worn as a leisure shoe. Pair them with jeans, moleskins, corduroys, or heavy woolen flannels, and anything as casual as a quilted jacket or waxed cotton coat, to something a bit dressier such as a tweed sports jacket. Sneakers: For near year-round casual wear, I also think you should own a pair of canvas sneakers – Chuck Taylors, Jack Purcells, Vans Authentics, Supergas, Spring Courts, and the like. These are a relatively cheap way to add another pair of shoes to your weekend rotation. Each retails for between $40 and $60, and can be had for a bit less if you wait for sales. Plus, white canvas sneakers can look more harmonious with certain casual outfits than leather shoes of any stripe. The seventh pair: The seventh pair will be up to you. If you live in a climate with harsh winters, perhaps you can pick up something from Jesse’s list here. If you live in warmer weather conditions, perhaps you’d like a more interesting pair of slip-ons, such as monk straps or tassel loafers. The point here is to choose something according to your needs or whimsy, in addition to what I think are the bare basics above. And that’s the seven-shoe wardrobe. Enough to get you through nearly any occasion on any day in any season, and with enough options to allow you to properly rotate through your shoes while not having so many pairs that anything will be neglected. 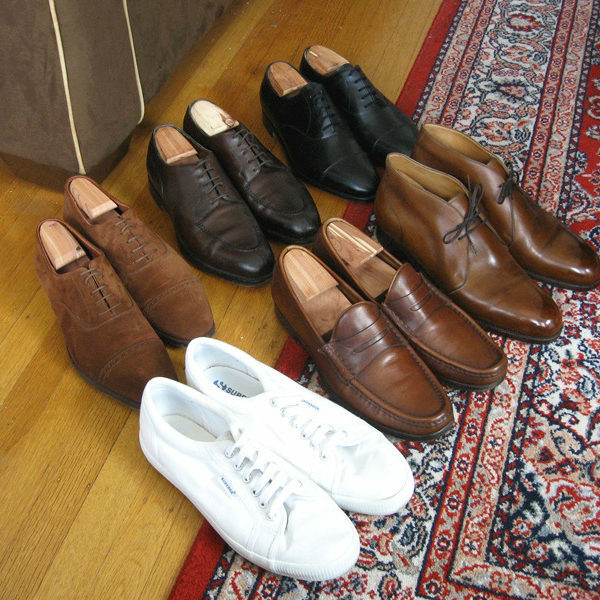 This to me is a basic and well-rounded shoe collection.